Flying squirrels are abundant in New York, although most people never see them due to their nocturnal lifestyle, and are surprised when they discover just how prevalent they are. Flying squirrels are also quite honestly incredibly cute, especially when they glide between tree branches like the squirrel version of Superman. Part of what makes them so cute are their big, adorable eyes, which happen to be so big because they evolved to be able to see at night. While most people in the state may not catch a glimpse of these cute critters, they are surprisingly bold and will approach people at their homes if sufficiently enticed (usually involving leaving out bird seed or other food for them to eat). Some flying squirrels will even take up residence in people’s homes if encouraged to approach the owners. Flying squirrels are an interesting mix of bold as well as shy. One couple living in New York sees them regularly feeding from one of their bird feeders. 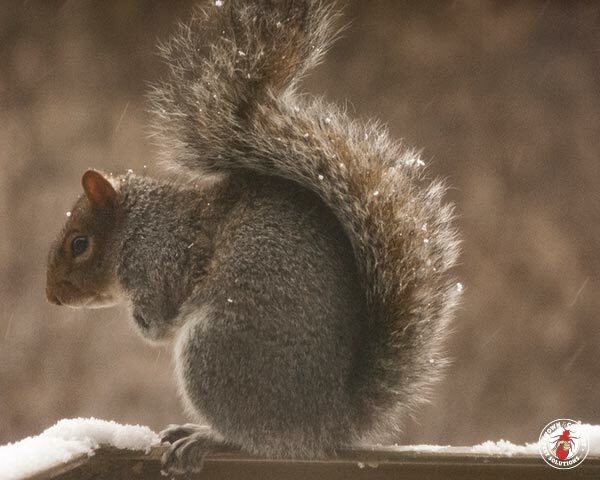 They typically glide onto the birdfeeder, grab some seeds, and then glide back to a nearby tree to eat their snack. They will dart away when caught in the act by someone, but then peek back around the tree to look at the person. The first time the homeowners found them eating at their bird feeder, one of the flying squirrels even let them feed it by hand. When flying squirrels take up permanent residence in someone’s house, the relationship between squirrel guest and the person living there is not always a positive one. To a flying squirrel, your house is basically like a giant, warm tree cavity, their shelter of choice, so when winter comes, it makes the perfect home for them and any little ones they may bring along. One way you can tell if a flying squirrel has decided to make your home their home is by hearing chewing noises and the sound of the little critters scampering about inside your walls. And once one flying squirrel is living with you, it is highly likely more will be joining them. Many people consider them a nuisance in this case due to the noise they make, their droppings left on the floors, and the compressed insulation. Removing them during the winter, however, can spell death for these creatures. People have also found litters of flying squirrels living with their parents in their house, so that is also not the best time to kick them out on the street. When you do decide to finally evict the cute troublemakers, the best course of action is to let the professionals handle it so everything goes smoothly and no one gets hurt in the process. Have you ever seen a flying squirrel in your backyard or house? Has your house ever been invaded by flying squirrels?